hoy os muestro los últimos accesorios que han llegado a casa. Y aunque muy pronto os los voy a mostrar en mis looks, os he hecho un pequeño bodegón para que los veáis antes. -El collar con el colgante dorado de las tijeras y el pompón rosa es de la marca Abataba. En su página web podéis ver toda su colección, tienen complementos preciosos. Éste en concreto queda genial con camisetas lisas y vestidos. -La gargantilla rosa flúor es de Zara y aunque está también disponible en color amarillo creo que a ésta le sacaré más partido. Un besazo guapas y mil gracias por estar ahí. -The golden pendant scissors are from Abataba brand.You can see all their collection in their website. They have very pretty things. This one specially looks good with T-Shirt and dresses. -The pink fluor necklace is from Zara. You can find it in yellow color too, but I have chosen this one in pink. 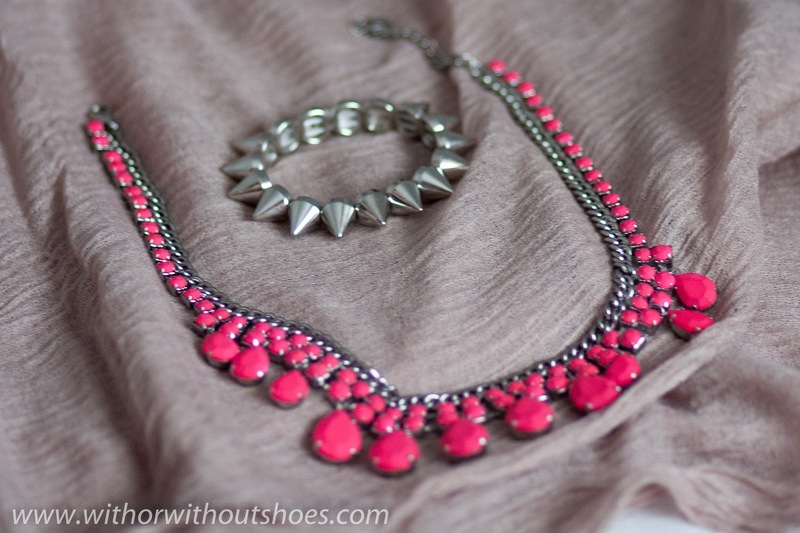 -Golden spiked necklace and silver spiked bracelet are from ebay. What do you thinnk about my new jewelry? Love and million of thanks for being there. Qué monada el collar con las tijeras! Wow! Very nice, I love the zara necklace. The scissors necklace is so adorable and I love the necklace from Zara. 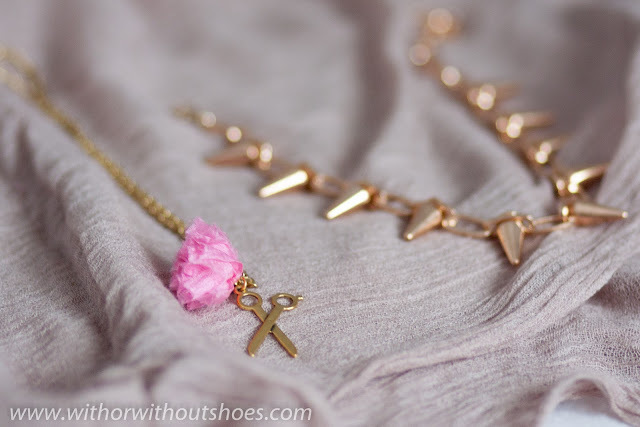 The scissors necklace is so adorable and I love the necklace from Zara as well! Love the neon pink one! Join my win-party, 8 days of give-aways! Amazing purchases, love the fluo necklace! Y el collar punk de que tienda de Ebay es? Me recuerda a las pulseras Punk de Asos! yo también lo quiero saberrr! ahora te mando un correo! Chulisimo todo! !, necesito una pulsera de pinchos pero ya!!!. great jewellery! like the scissors most! Great post: I like these purchases so much, especially the fluo necklace!! nice stuff! 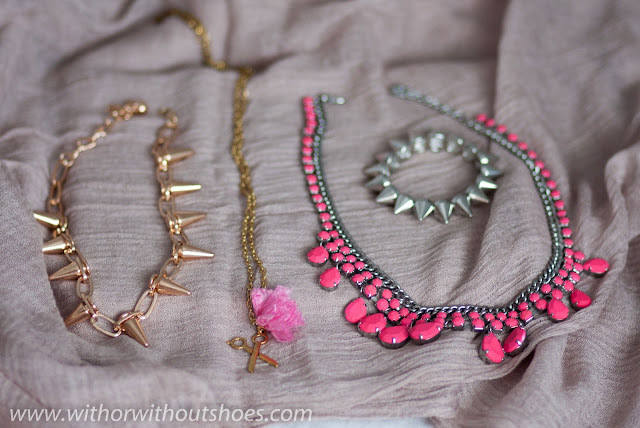 I love the pink necklace the most! Amazing! My favourites are the ones with spikes...I've been kinda obsessed on spikes lately :D! Nice necklaces ! I like them ! I like it! 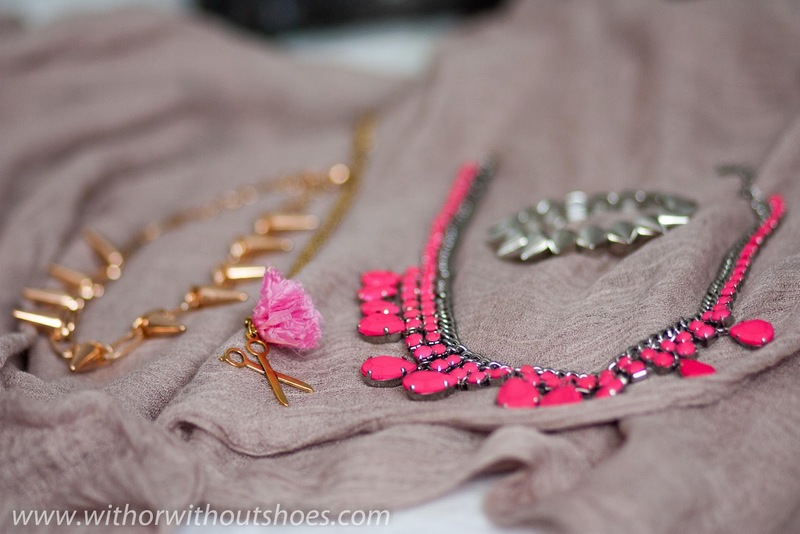 Especially the gold studs necklace! I found your blog and wanted to let you know that you have impeccable style! me encantan todos! el collar fluor de zara tb lo tengo!!! omg me acavo de enamorar! que hermoso collar neon!! !